Come inside they said. Have an adventure. Licking toes is not against the law, Micron pleads his case to me. It’s even extra legal during summer, right? I mean, if people didn’t want a dog-spit bath on their piggies, then explain to me why, on dog’s green earth, would they have them just hanging out there in front of me? Honestly, it’s not like I need an engraved invitation. Summer is indeed Micron’s favorite time of year. So many toes dancing around in flip flops. Right there within tongue’s reach, for dog’s sake. Little girls in their pink sparkly sandals, women’s waitress red pedicures in strappy wedges, guys with hairy hobbit toes in beach flip flops. Micron doesn’t deign to discriminate. The dog’s never met a nekkid toe that didn’t need a quick warm up. And the winter months are as bleak and gray for the yeller feller as it is for us human beans. Sure there’s the occasional college student that walks around in flip flops with complete disregard of the temps, but these creatures are a rare sighting. When Micron was a pup in training for CCI, I had to keep an eye on the furry fellow and remind him to pay attention instead of diving into someone’s sandals. This was not a behavior becoming of a service dog, we’d tell him. Sure, we had some challenges with his golden personality, that pesky lack of work ethic perhaps the biggest. But sandal diving was right there top of the list, too. He eventually reached the understanding that toe licking was something not to be done. At least in front of me. In his doggie noggin, it’s only wrong if you get caught. So my little problem solver figured this out – if he sticks his tongue out of the side of his snout, the side facing away from me, it takes me longer to catch him. An effective technique that. While I would be deep in some profound conversation with a friend dissecting last night’s Downton Abbey episode, Micron would be in a solid Down. All is right in the world, until . . . um, Donna? Your dog’s kind of a perv. Sure nuff. Another Micronism: if the belly doesn’t leave the earth, it’s still a Down, isn’t it? The goober has army crawled the three inches to reach those bare little piggies and yes indeed, there’s a pink tongue poking out of the side of his mouth. Like an addiction, I suppose. You have to want to quit. And Micron’s made it clear he has no intention of changing this lifestyle choice. And now that this wonderful dog is no longer a candidate for a service dog career, and is now my beloved pet, I admit I’ve dialed the toe licking corrections down a couple of notches. Still, it would be nice if the dog could exhibit some self-discipline. Maybe cut his ten-toe-a-day habit down to five or something. That’s Micron in the slammer. See his noggin looking out? So when we visited the Boonshoft Museum of Discovery recently, we had a opportunity to take this differing opinion (“Dog Tongue Toe Baths” Micron: Yes, Me: No! Don’t!) to a higher level. 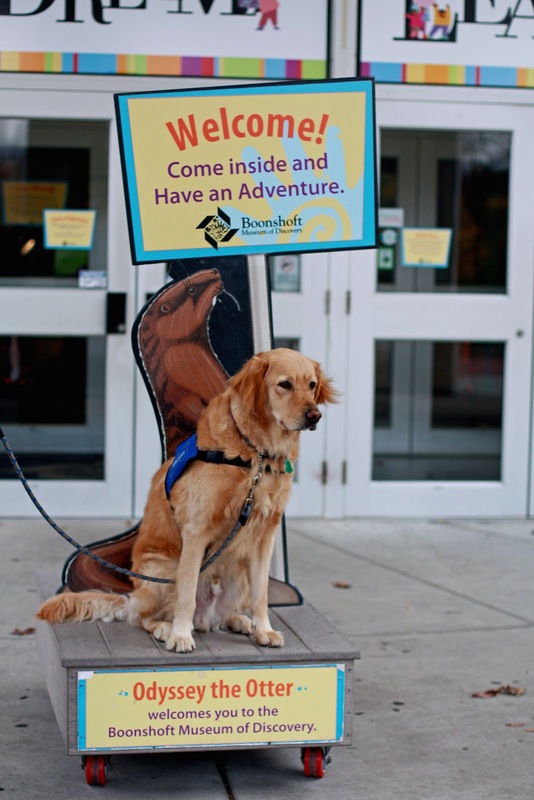 We were on our way to present some information about Animal Assisted Therapy to a group of kids putting together a service project. But first we came across the museum’s courthouse. Hey, Micron, I say. Whadya say we involve the legal system here. Get a jury of your peers to determine just how messed up you are. Bring it!, says Micron. You’re on, Food Lady. 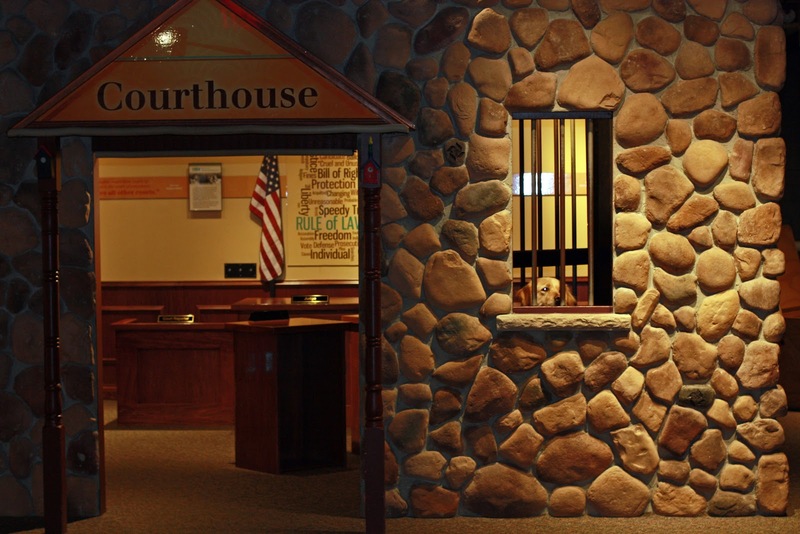 The trial gets off to a rocky start when the lawyers don’t bother to show up. No matter, says Micron. Lawyers don’t wear sandals in court. That would just be a waste of tongue. I’m not well versed in this legality stuff, but I told Micron that I’ve seen on Law & Order or something that he can be his own defense council. He declined this right and wanted to just get on with this thing. Instead, he does choose to testify on his own behalf. I didn’t do it, yer honor! I was framed. he cries. It was the cat. Oh shoot, I forgot. Dogs can’t lie. Yeah, I lick toes. But the cat did do some other stuff. Does that count? Sometimes having a jury of your peers may not be the best thing, depending on the person in question. But for dogs, I can see how it could work in their favor. 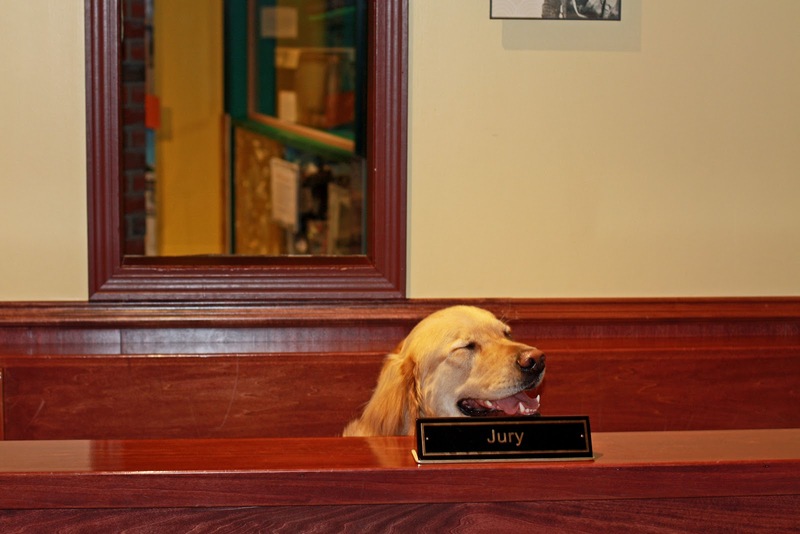 zzzzzzz[snert], says the Jury. Wha? Oh yeah, it was the cat. We’re unanimous on this one. 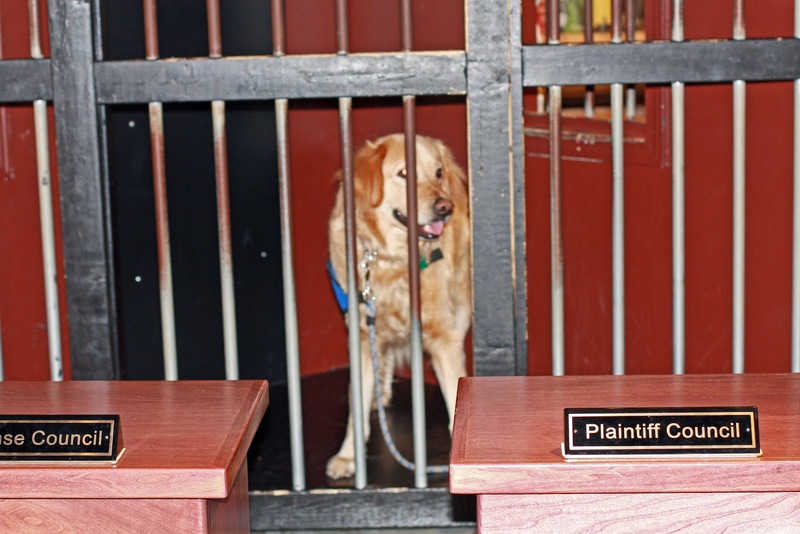 We declare the defendant Not Guilty by Reason of Gooberness. croc shoes, that would be a crime. His Honor, Judge Gavel Eater, declares this trial as a done deal. It’s always the cat, says the Honorable Judge Gavel Eater. Those things should be illegal in all fifty states. I declare a lunch recess. Who’s buying? 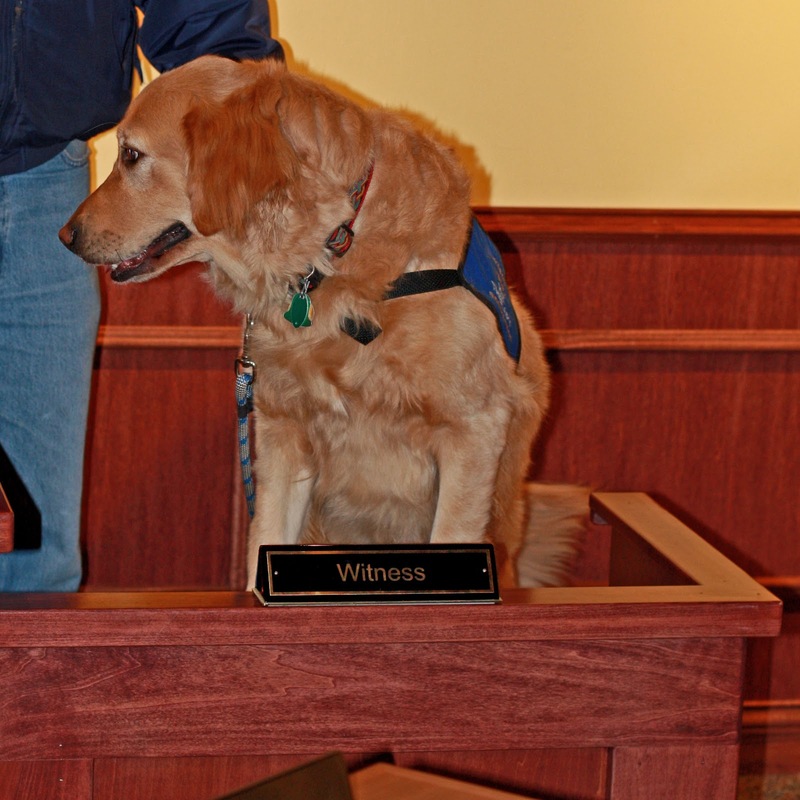 Can I get another gavel here, bailiff? Well, justice was swift. I’m still not sure what happened here, though. I may have to appeal. I suspect there may have been some dog cookie pay-offs going on. 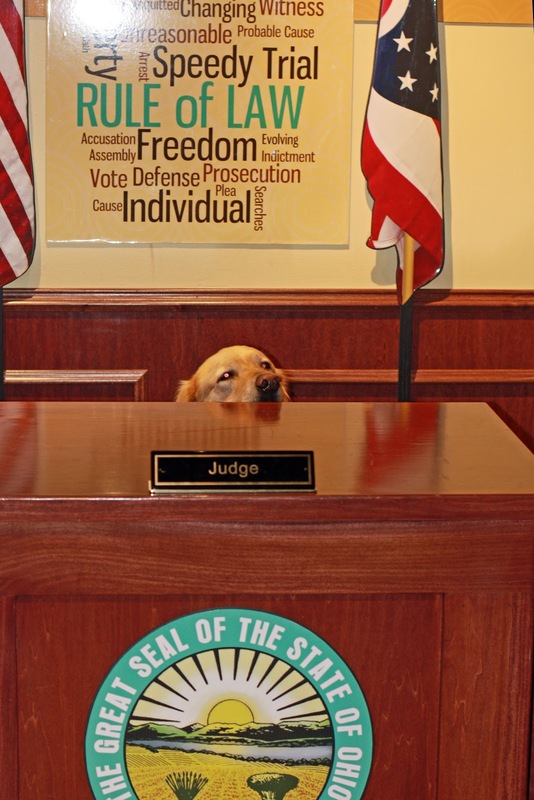 I don’t know, but that judge looks like he could be swayed easily by a yellow tennis ball. Donna – you are planning to write a book, right?! You are such a fabulous writer! !